Today the New York Times has a story about all the bitter Mets fans who can’t decide who to root for (or against) in the World Series. The unfortunate reality for everybody in America who isn’t a fan of the Phillies or Yankees is that no matter who wins, you all lose. One of the two fanbases is about to get insufferably obnoxious. You thought Boston was bad after the Sox won their 2007 World Series? You ain’t seen nothing yet. It’ll take the Yankees fans about five minutes to go back to being every bit as insufferable as they were in the late nineties, when winning was their birthright. There is no chance — none — that nearly a decade of playoff stumbles has humbled this bunch. They do arrogance like Bob Ross did puffy clouds. When the Phillies won their World Series last year, we Phils fans viewed it as nothing short of a miracle. We didn’t boast too much, because we understood that whoever or whatever higher power is in charge of dolling out karma clearly fell asleep at the wheel and we got lucky. But this year, if the Phils beat the Yankees there will be one inescapable conclusion: our team really is this good. And we’ll make sure you’re reminded of it often. Like I said, either way one group of fans will get a much unneeded ego boost. So who to root for? Simple. There are a lot more Yankees fans than Phillies fans. A lot more. If you want to minimize the level of obnoxiousness in America, the Phillies should be your choice to win the series. 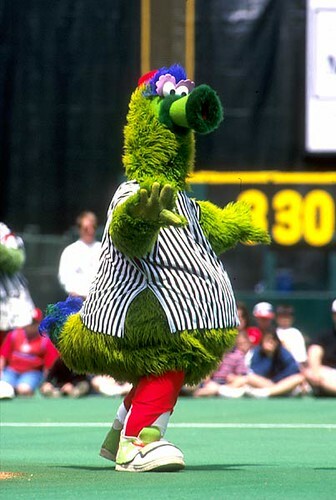 Sure, there are other reasons to root for the Phils. A Phillies victory would further chip away at the notion that the AL reigns supreme. And it’s always nice to remind the Yankees that money can’t buy happiness. And wouldn’t you just love to see a close up of Kate Hudson consolling her man as he cries into her surpemely toned shoulder? But really, it all comes down to minimizing assholishness. That’s what a Phillies victory would do. 1) Mets fans are New Yorkers (generally). Yankee fans would root for the Mets if the roles were reversed. 2) Jimmy Rollins is the most insufferable player on either team. 4) Mets fans love Xavier Nady, who would technically get a ring. 5) Yankee fans never booed Santa. 6) The AL does reign supreme. That’s because the AL is better at baseball. 7) The Phillies ain’t exactly a low-payroll team. I live in Philly and it’s a different kind of narcissism. It’s more like” we like guys who crash into walls and play hard, we like blue collar players…blah blah. All cities have they’re good and bad fans. No one city is better then the other. Tell me one city who praises another cities fans??? There’s bandwagon and die hards in every city with the exception of St.Louis.You didn’t see Phillies fans in Shea and Citi Field until the Charlie Manuel era or Baltimore for that matter which is even closer. Red Sox fans were always in Memorial Stadium and Camden Yards. Oh well Go Philies!! This Mets fan is fantasizing about an early Nor’easter and cold spell that drops a foot of snow on the East Coast, thus forcing Bud Selig to cencel the WS (again). The side bennie is that Bud will realize what an abomination November baseball is. Where to start? Eric, you’re right that the Phillies aren’t a low payroll team, but the Yankees payroll is nearly twice Philadelphia’s. When it comes to spending money, there’s the Yankees and everyone else. Also, the AL is the better league. That’s a fact. But that doesn’t mean we NL fans have to like it, or that we can’t enjoy taking the AL down a peg every once in a while. Also, I challenge you to explain why Rollins is insufferable, and why the Mets fans love Nady so. Please, enlighten me. Johnf, no city is better than the other? You mean to tell me the fans in Boston aren’t better than the fans in Miami? Or DC? What about Tampa, where a World Series appearance did little to boost attendance? Surely you’ll agree that some cities are worse than others? I’m from Philly, and I have no problem admitting that we are a bunch of degenerates. But I don’t mind. At least we’re passionate. At least we care. I’d hate to root for the Rays, to go to games where the stadium is half empty and the crowd is silent. There’s bandwagon and die hards in every city with the exception of St.Louis. Why do people give unwarranted credit to Cardinal fans? It really grinds my gears. They are just like the rest of the 4 million plus fan bases, except they put on a smile when things go bad. Good for them. They are nice farm people. But they do not deserve any more props than the next set of fans. It is like saying Yankee fans are bigger douchebags than Red Sox fans… actually that may be true. My point still holds. PS A Phillies win would make life WAY easier for most of the country. Go Phils! As a diehard Giants fan, and therefore a NL fan, I would love to see the “inferior” league beat the “superior” league…again. Explaining why Mets fans love Xavier Nady is like explaining why Germans love David Hassehoff. They just do. Eric, you can’t be serious about using the NY Post in an argument about trash talking and taste. Did you catch the article called “The Frillies are Coming to Town?” The article was a long rant about how awful Philadelphia is as a city… the New York Post is one of the worst papers in the world, it barely gets beat out by Pravada as most blatant propaganda paper of all time. So yeah, trash talking arguments are now out, both sides do it. Both sides do it, but Rollins gets points for always being right. What planet are you from? Filthy Filly fans were out in droves bragging on ALL the mets websites and ALL NY newspaper websites all year. I am a dedicated fan of the Phillies and I would like to know why these Umps see a strike when the diagram they show us on the screen shows a ball. Last night it was a disgrace. I think that at least for the World Series they should have instant replay. Why show us the diagram if they are allowing the Ump to decide. Why do we need a Home Plate Ump when his call is wrong according to the diagram. It’s just not right. Janice, I think it’s important to recognize that the pitch trackers that Fox and TBS use are not necessarily accurate. But you’re right that, if a sport like tennis can embrace technology that accurately tells when a serve is in or out, it’s getting harder to stomach that baseball won’t adopt technology that would better call balls and strikes. Especially in light of all the missed calls this offseason. At least, that’s how I feel. Janice Forte: I think it’s the TV network that gets the calls wrong when their diagram shows the ball outside the zone. Keep instant replay in football where it belongs and don’t bring it to our game. Baseball has been played for over 100 years without instant replay and we don’t need it now. Umpires have never been perfect. That’s part of the beauty of the game.